If you read my last weekly weigh in you will know that I have been doing the Exante weight loss diet. I did really well the first few days then I started to sneak in a little cake (cake day at work) and last night I completely fell off the band wagon and had a pasta dinner with everyone else. Also I didn't fit in the daily recommended 20 minutes of exercise. The meals are made up from shakes,porridge, soup and evening meals. The evening meals certainly take some getting used to and towards the end of the week I found them easier to eat I wouldn't say they were tasteless but they certainly don' taste as good as 'normal' spaghetti bolognese or chicken curry. There are no chunks of meat and they is a very fine texture to the meals, they are almost like a chunky soup. However I loved the shakes and the porridge, they were so tasty and really set you up for the day. I couldn't chose a favourite flavour milkshake as I thought they were all nice. As for the porridge it was actually the nicest porridge I've ever had. I probably liked them because they tasted so sweet and I do have a sweet tooth. They both kept me full until dinnertime. I didn't enjoy the lunch time soups as much as the breakfast. I felt like they tasted as if they were bulked out abit and I thought you could tell they were made from a powder. Again though most of the time I didn't feel hungry. Overall I would definitely do the diet again IF you can choose the meals that you are sent. 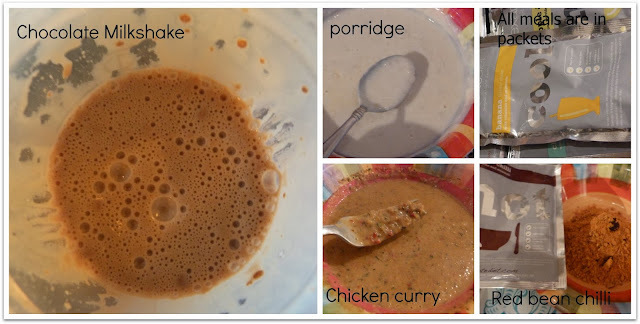 I didn't particularly enjoy the soups but if I could have the porridge for breakfast and the shakes for lunch it would work perfectly for me. I didn't feel hungry during the week which I thought I would, I never thought looking at the packets that they would be enough for me to last the week. I lost 6lb this week which I'm super impressed with. It the most I've ever lost in a single week so I would consider doing it for a longer period of time if I could choose the meals. This week I'm going to concentrate on getting enough exercise in rather than what I'm eating. What are your thoughts on Exante diet, would you try it?